Requires Practice // The only guaranteed way to get better at this part of your service is to practice. The music team spends hours playing the same music over and over to get it right. The speaker spends hours sweating the details in order to impact people. The reality is that many people who do the announcement portion of the service look at a bullet-point list of items just before they step onto the stage. When two people make the announcements, it requires them to talk through the elements and practice together, which helps them improve. This part of the service is about moving people to action and getting them connected. It deserves to be well thought-out and executed! Increases Diversity // As a church grows, it needs to appeal to a broader community. One way to do this is to have a variety of people on stage at your church. If it’s all guys on the stage, you may be unintentionally sending the message to ladies that they are less welcome in your church. If everyone on stage is over 65, you communicate to the next generation that there isn’t space for them. Co-hosting increases the diversity of people on stage. Don’t pick two people who are too similar. Instead, take this opportunity to appeal to a broader group of people. Builds Influence // The people who are on stage gain influence in your church. People see them and they begin the process of trusting them. Although we don’t want the stage to be a shortcut around the “hand-over-hand” work of building a church, it is a valuable tool for increasing the profile and leadership of someone on your team. Regular hosting helps people to know, like and trust leaders. It sets them up as being aware of what’s happening at the church so people will look to them for information. There is also an implicit endorsement by the church of the leaders who share the stage at your weekend services. Models Reactions // When someone is on stage with you, they can model the reaction that you are looking for during an announcement. They can be happy about an upcoming youth event or show condolence when you share some bad news. You’ve seen this happen on the evening news when co-hosts react to the news as it’s presented. It helps engage and draw in people. You’ve also seen this done poorly on home shopping infomercials where the co-hosts are overly excited about what’s being sold. Don’t do that! Learn from the principle behind those sorts of actions and bring up a co-host who can help model reactions for people. Trains Leaders // Constantly training others and releasing ministry to them is core to our role as church leaders. Often, roles like this require “public face time” that we’re hesitant to give away because we’re not sure how to train people. Resist this temptation! 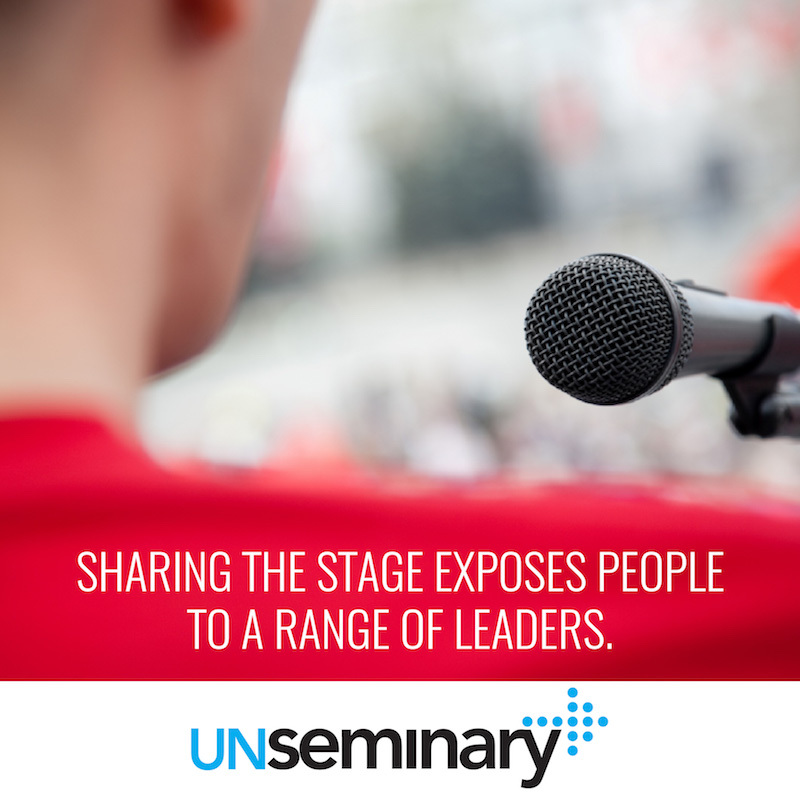 Bring up another leader on stage to co-host with you and have them start by doing just one part of it. Putting them in front of people will be an adjustment. Remember, public speaking is at the top of most people’s list of greatest fears so ease them in. As hosts get more comfortable, and as you get more confident in their abilities to move people to action, give them more parts of the announcements. As their proficiency grows, you can hand off the responsibility of raising up other co-hosts. Departure Insurance // Can we be honest for a moment? The people who are with you today won’t be with you at some point in the future. All leaders are temporary to some extent. People move on for one reason or another. If you have the same host in front of your community all the time, it makes these inevitable transitions more difficult. Sharing the stage exposes people to a range of leaders and can help you when you need to move people to a different seat on the bus. Obviously, you don’t want to put leaders in front of your people who are a high “flight risk” but having co-hosts helps expand what people are used to seeing on weekends. Scott Elliott and Christine Birch co-host most weeks at Liquid Church‘s Mountainside Campus. I asked them to provide some feedback and help for leaders who are interested in co-hosting. Here are some helpful tips from them about what they’ve learned from doing this on a regular basis. Include Smile Moments // Don’t feel like you have to be a comedian or make people laugh. Just try to help people smile! Avoid formal jokes. Instead, tease and make fun of each other, interact and have fun! Never take yourselves too seriously. Synergy in Energy // When co-hosting, nothing is more awkwardly obvious than mismatched energy. You both want your energy to be over the top so it reaches the back of the room, while striking the balance of authenticity. Stage Presence // Don’t be afraid to look like friends! If there is too much space between you and your co-host, it will look like you don’t like each other. Stand close, gesture toward each other and nod engagingly when the other person speaks. Make it a conversation. Roll with the Punches // Co-hosting is harder than hosting alone. There is shared content to communicate, which means more opportunity for missed cues or stealing lines. Lean into the mistakes, support each other and have fun with it. Don’t be afraid to be honest and poke fun at each other if things go wrong. Here is a random weekend at one of Liquid’s campuses where Raf & Kayra were co-hosting. If anyone has a link to a video where this is done well, I’d be very interested. Lorenzo … I’ll poke around and see if I can find one. All announcements should be on video. Play them before and after the service in the lobby or entry way. Distribute them on the social media platform(s) of your choice. Play only a short, edited version (if you absolutely must) during the service. I have often wanted to take a survey, right after a service, to see what announcements people remember. My guess is it will be close to zero or worse. They will remember incorrect places, times, and dates. Announcements destroy worship. They destroy the flow, the reverence and the awe that we should experience when we are in the presense of the Living God. Thanks so much for dropping by and for your comments. I understand how you feel about announcements. In fact, I felt the same way at one point but I’ve found over time if we give announcement the right place in the service they actually can be a vital part of what happens. 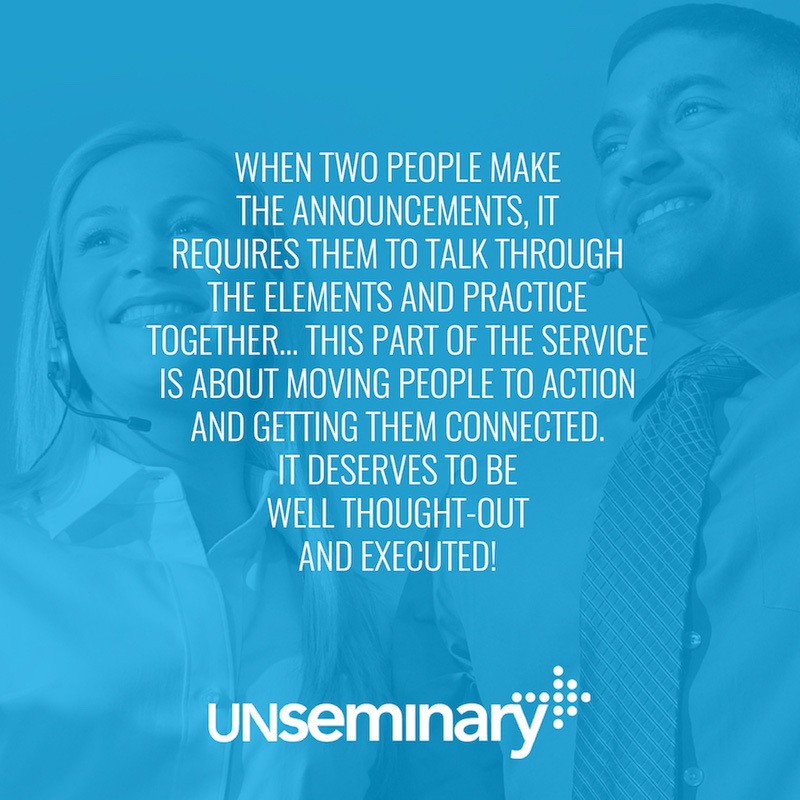 Announcements are the part of the service that move people to action. They point people to how to get connected to community. 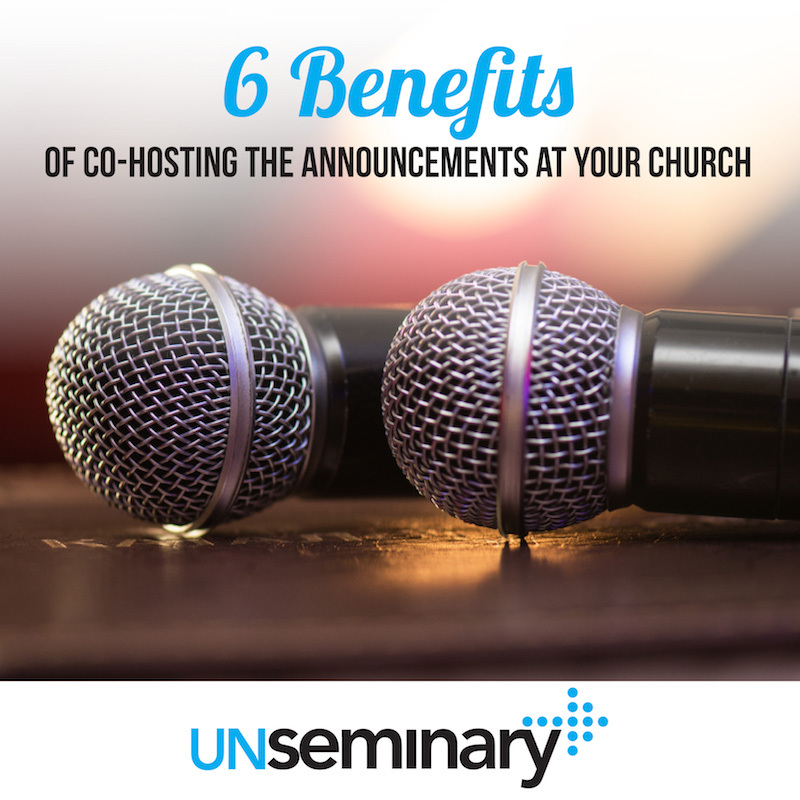 They invite people to engage in the mission of the church. They take the transcendent experience from the weekend and point it into the rest of your people’s weeks. They need to be done with elegance and forethought … but I really do believe they can enhance the mission of your church not distract from it. We do announcements between worship & message.But we are about to use a live person also for welcoming,to explain what’s about to take place.Do you know of a website or place that has great welcoming scripts?